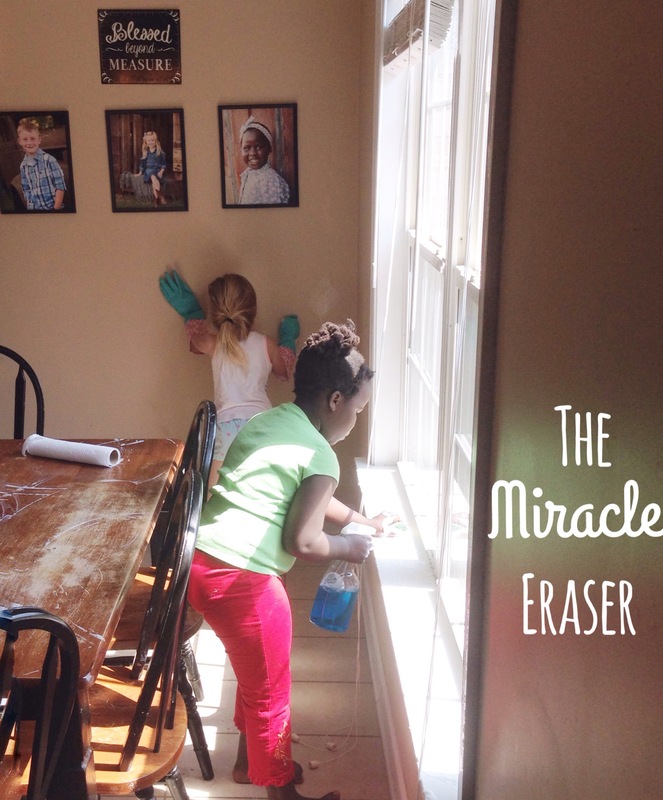 Today I introduced my girls to the “Miracle Eraser.” You know, sponges you can buy in the cleaning products aisle that get the nasty grime off when a regular scrubber just can’t get the job done. I gave them both one and let them have at it on the walls around the kitchen table. “Gross. You can find gross stuff in a house, Especially if you have kids,” I overheard my vanilla daughter, Arabella, talking to my chocolate daughter, Sharon from the laundry room. I just hovered there I was and listened. “I actually like doing this. We should do this everyday,” Arabella continued chatting. “Yes!” I was thinking. Maybe they will really stay motivated and scrub all the walls in the house! Well, that didn’t happen. But a good conversation did. We closed the blinds and I showed them all the splatters of food standing out against the white vinyl. But then, when you feel sorry for it in your heart, and you ask Jesus to forgive you, this happens; I said, as I sprayed the windex and scrubbed it with the miracle eraser. See, it’s gone, sparkling white again. We don’t have to keep looking at that nasty spot anymore. …and we have removed the stains around our kitchen table…finally! Thank you Jesus! It’s been a long time coming!!! Only 2 more days left in this Spring Cleaning Series! Stay tuned to hear what’s happening next right here at Refocused Bible Study!! !